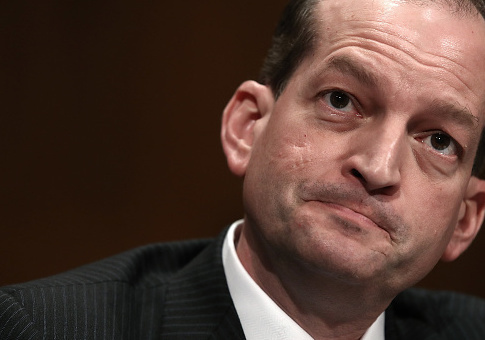 The Senate is expected to confirm Alexander Acosta as the next Secretary of Labor by the end of the week. The Senate will hold a cloture vote on Wednesday to move Acosta's nomination to the full Senate floor and Republicans expect to hold a vote before Friday. Acosta, dean of the Florida International University School of Law, will be one of the last cabinet officers to be seated in the administration after President Trump's initial nominee, fast food executive Andy Puzder, withdrew from consideration in February. Senate Democrats vowed to provide a united front against Trump's cabinet selections with Minority Leader Sen. Chuck Schumer (D., N.Y.) vowing to do "everything we can to stop these awful nominees" in February. The HELP Committee voted to recommend Acosta to the full Senate floor on a 12-11 party line vote in March, but at least one Democrat, Florida Sen. Bill Nelson, has said that he would support the nomination. Republicans, who hold a 52-48 edge in the Senate, need only a simple majority to confirm Acosta. A spokesman for HELP committee Chairman Sen. Lamar Alexander (R., Tenn.) told the Washington Free Beacon that he expects Acosta to win confirmation and begin serving the administration by May 1. "Senator Alexander looks forward to the Senate confirming Mr. Acosta this week so the new Labor Secretary can begin working with Congress to create an environment for workers to succeed in the rapidly changing workplace and rolling back Obama regulations that made it harder to create, find and keep good-paying jobs," the spokesman said. Schumer did not respond to request for comment about whether he intends to filibuster the nomination. If Acosta advances past the cloture vote on Wednesday, the Senate may hold up to 30 hours of debate on the nomination. This entry was posted in Issues and tagged Alexander Acosta, Big Labor, Department of Labor, Secretary of Labor. Bookmark the permalink.